This pp won the first place in the paid app music category of the pp Store of 19 countries , including Japan ! ! ( December 11, 2015 time ) n easy way to create your own original tunes! Chordana Composer makes it easy for you to write your own tunes, even if you don't know how to compose music. You can enter a motif (twobar melody) using your choice of 3 input modes. There's no need to enter the melody for the entire tune. You just enter one motif and Chordana Composer automatically creates a whole tune, so you don't have to spend ages composing the music. Product Features 1. Three ways to enter your motif (2bar melody) melody that comes to you in the middle of an ordinary day... Have you ever thought “This would make a really great tune. But need to know how to compose, and it's no good if can't read music. nd that all takes time to learn”? Chordana Composer will take care of all those concerns. Just enter 2 bars of the motif you thought of. Chordana Composer will automatically make it into an entire tune. You can choose from 3 types of input method. 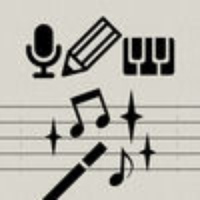 n "Keyboard input mode" you use a virtual keyboard, in "Notation input mode, you paste the notes into a sheet of music, and in "Microphone input mode", you just sing the motif into the microphone. 2. utomatic composition by choosing "Genre" and "Concept" Once you've entered the melody using one of the modes above, you're ready for automatic composition. Choose whichever combination of "Genre", "Concept", "Range of melody movement" and "Level of melody tension" creates a tune that best matches what you've imagined. 3. Your own editing using the Hints function n Notation input mode, you can edit the the created melody yourself. f you enable the Hints function when you're editing the tune, the notation is color coded as a reference for your edits (notes that match the chord, notes in the same scale, notes that increase the tension and other notes you need to be aware of). 4. Using simple steps, you can upload your finished tune as a video to YouTube along with the staff notation, or slideshow of photos. You can also send your tunes as email attachments in C or MD format, and it's really easy to make your own ringtones1 too. 1 To use your tune as an iPhone ringtone, you need to connect to a Mac or Windows computer and transfer the tune to your iPhone via iTunes. 【Operating requirements】 iPhone 5, iPhone5c, iPhone5s, iPhone6, iPhone6 Plus iPod touch (5th generation) ※ iOS8 or later required. t's also easy to share finished tunes. Check these links to find your download for Chordana Composer for & iOS or for your device iPod TouchiPhoneiPad. The app Chordana Composer is compatible with te following devices.